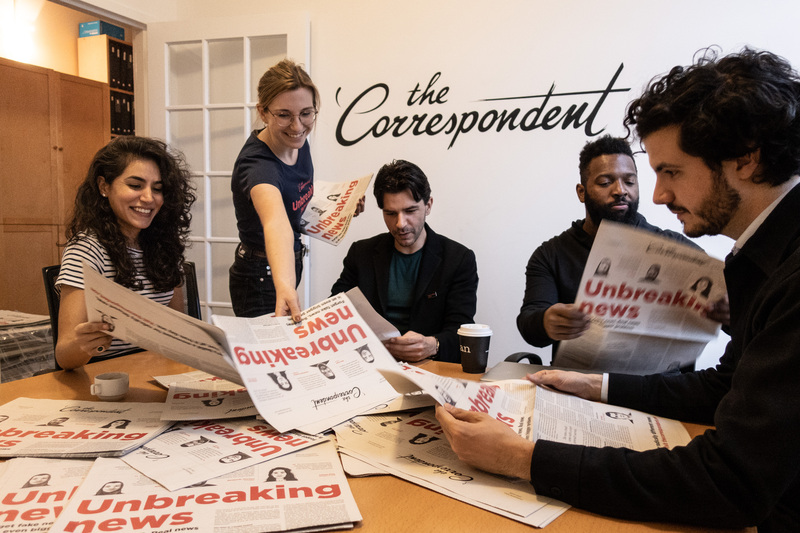 Ernst-Jan Pfauth is co-founder and CEO of The Correspondent, which is launching this year as an English language spinoff of the Dutch news site De Correspondent. Ernst-Jan Pfauth is co-founder and CEO of The Correspondent, which is launching this year as an English language spinoff of the Dutch news site De Correspondent. Offering “unbreaking news” and “a daily dose of medicine against the issues of the day,” both are the products of record-breaking crowdfunding campaigns. Both publications sustain themselves without advertisers. Stressing subscriptions over scale, De Correspondent launched in 2013 with €1.7 million from 18,933 members. Membership has grown over fourfold since then. Subscriptions and book sales are De Correspondent‘s primary revenue sources. Today The Correspondent is closing on its first 50,000 subscribers with $2.6 million raised in pre-launch funding. 9/ Not just the problem, but what can be done about it. In Europe, they call it "constructive journalism." In the US, solutions journalism. The idea: Your report is incomplete — lacks depth — unless it includes what we can do: as individuals, as a society or political community. This approach to journalism slows down and deepens communication by focusing issues around the people and the communities they concern. The constructiveness of this approach may have a lot to do with its calming and humanizing effects. Ernst has written several Dutch best-sellers, including a Thank-You Book or “gratitude” journal that came out of his efforts to overcome anxiety about public speaking. In his reflections on work, overwork, and gratitude for TEDx, Ernst emphasizes that resistance to “the burnout society” where “creativity is crushed” is a collective task: everyone needs to make daily space for their close relationships where work and media do not intrude. I am grateful Ernst took some time after the holidays to talk about his experience with WordPress, collaborative online communities, and democratized journalism. Here is the conversation we had. DK: What are your thoughts about WordPress today? Have you made any connections or maintained relationships with the WP community in other ways? EP: I started using WordPress in 2006 when I launched my personal blog ahead of an internship at a press agency in the United Nations HQ in New York. The fact that I then, as a twenty-year-old, could start a publication in such an easy way, has been crucial in my career and something I will be the WordPress community eternally grateful for. Since then, I have started several sites, most of them running on WordPress. In 2007 I co-founded the blog of The Next Web Conference, now known as thenextweb.com, in 2009 I started a news blog for the Dutch daily nrc.next, and in 2010, as head of digital at the Dutch quality newspaper (NRC Handelsblad), I switched their main site from ‘Escenic’ to WordPress. The fact that we could so easily build our own plugins (for example, a liveblog feature to cover the Arab spring) was crucial in the success of that news site. Also, the developers enjoyed their work more, since they could give back to the community. I still run my personal site on WordPress, and even though I don’t publish there anymore, I love to stay in the loop of new WordPress releases and the ever-increasing user-friendliness of the software. In lost moments, I enjoy reading the developers forums and checking their discussions about new releases (I admire the distributed, self-organizing and voluntary efforts of the community) but I’m not in touch with one of the members. I’m just an admiring bystander. DK: Can you explain when and why you came to see community and membership features as essential to a CMS? What does it look like when the idea of membership/audience inclusion is integral to the software architecture and vision? How are you doing this in Respondens? Also, our approach to reader interaction — as you mentioned — is a unique asset of our CMS. I elaborate on that in this Medium post, “Reinventing the Rolodex: Why we’re asking our 60,000 members what they know.” We believe in the democratization of the journalistic research process. Anyone could be a source, anyone has expertise and knowledge to share within a specific niche. 1/ THREAD: There’s a great untapped resource in journalism, and it’s available to every journalist right now. It’s the experience and expertise of your *readers*. Giving them the opportunity to share what they know, could fundamentally transform journalism. DK: How does your model of membership-based journalism change at scale, when you have potentially the largest possible national and international audience? Will you still ask your journalists to spend 30-50% of their time reading and responding to member comments and other feedback? Is this essential (or even possible) to sustain at scale? EP: The thought that you see your readers as sources of knowledge and expertise is crucial. It works for the local examples you mentioned, but it can also work for global topics. For example, we interviewed Shell employees from all over the world — who we found through our Dutch members forwarding a call-out. (“How reader engagement helped unearth the Shell tape.”) We also created the position of “conversation editor” to help journalists with the scalability of their reader interaction. Yes, there are scale challenges. We see our journalists as conversation leaders and our members as contributing experts. We notice when a journalist gets more feedback from their sources (their readers), they need a research assistant to keep up — for example by highlighting interesting contributions to them or taking over some interviews. These are tasks that can be easily outsourced, as long as the correspondent remains the main point of contact in the comment sections and guides the conversation. I don’t see the 30 and 50 percent as time to spend on ‘responding to comments.’ The comments are just a means to an end. The end goal is to involve your audience, so you can get a wider set of sources, become more inclusive and publish richer journalism. We estimate it takes 30 to 50 percent of your time to live up to that mission. DK: On the other end of the spectrum, does your model have things to teach small, local journalism and other membership-focused businesses that they don’t already know? In the new membership-based local journalism I’ve been watching in the US and Canada — local media startups where there’s no history or expectation of a printed product or advertising — there’s a definite limit on the subjects that can be curated and written (or spoken) about in a deep and penetrating way. Is this a low or slow-growth model that simply must be accepted? EP: It starts with being open about your mission as a journalist (all our new correspondents publish a mission statement when they start working with us) and then telling your audience what you expect from them. It’s about that personal relationship. The CMS, practices, technology and resources all follow. But it’s the being open to your audience input and being open about your shared goal with them that’s crucial. Anyone can do that. And when you start, it might even be easier to do it on a small scale, but it’s more intimate, and you can scale up as you get better at it. The Correspondent team browses their unbreaking newspaper. From left: Zainab Shah, Jessica Best, Rob Wijnberg, Baratunde Thurston, and Ernst Pfauth. DK: What do you do to keep sane and whole amid the busyness and stress of work? Are you still a practitioner of journaling and daily gratitude? Have your thoughts on that changed or deepened? EP: I still write in a gratitude journal every night and noticed this three-year habit has really made me more aware of ordinary but beautiful moments in life, and also taught me to enjoy the process instead of the end goal. I save my evenings and (80% of) my weekends for family and friends — and always have my phone on DND in those hours. Also: I don’t check my email before I have left my apartment. Setting these clear boundaries and turning them into routines have really helped me to stay sane in the busyness of the campaign. I loved reading about Ernst’s boundaries – especially about keeping his phone in Airplane mode and spending 80% of his week-ends focused on his friends and family. I hear ya, Nathalie! He’s a lot better at it than I am — and other members of my family who shall remain nameless. One thing I find helpful is to have a “dumb phone” with cell service separate from a smartphone or handheld device that operates only on wifi for calls and everything else. (Punkt has some really nice “dumb” models that still do SMS well, and Google Voice/Hangouts goes a long way.) On my smartphones and tablets, I have few or no social media apps, and the dumb phone can be switched off at night/weekends — and stuck in a drawer. Not looking at any of them in during getting-up and going-to-bed times is good advice too.